The decorticator removes the excess water of the abaca. But, a fiber of abaca could become a razor. Many have been mutilated in this process. Workers have not been provided with the appropriate tools. In Ecuador, it is common to call ‘mochos’ to people who are missing a limb as a result of an accident. At Furukawa Plantations C.A. 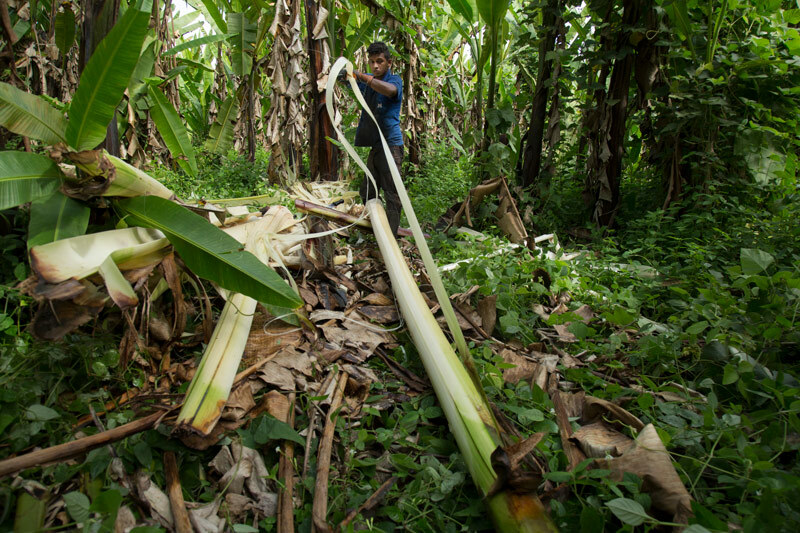 Of Ecuador´s farms, there are many abaca workers who have been mutilated while working. "Mocha leg, mocha hand", they say. 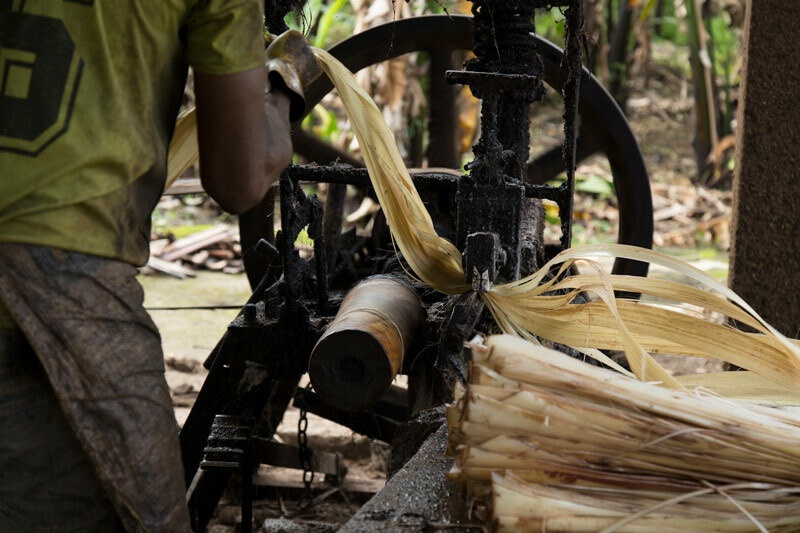 It is their way to explain the danger they face when processing the abaca without safety measures, appropriate instruments and protection for such a high-risk job. Furukawa is a company of Japanese bases, it was established in the province of Santo Domingo de los Tsáchilas 55 years ago. It currently has 32 farms with an area of 2.300 hectares distributed in this and two other provinces, Los Rios and Esmeraldas. 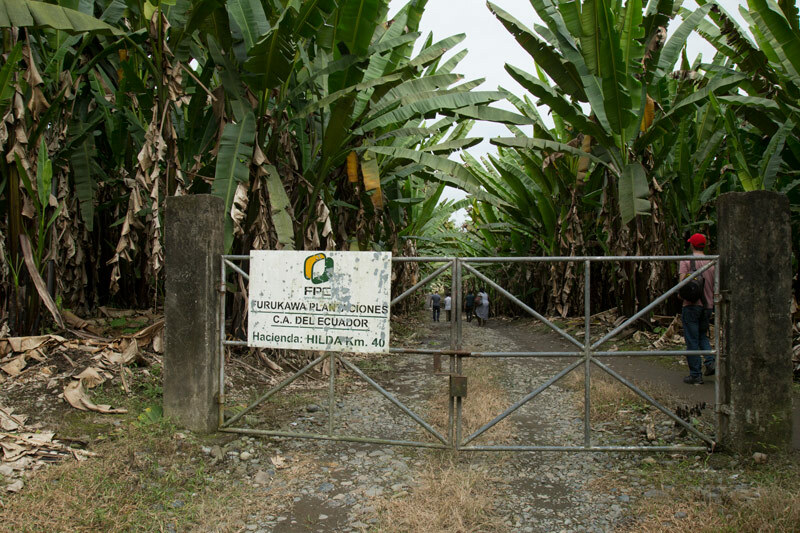 Even though the manager, Marcelo Almeida Zúñiga, asserts that the company has 198 employees on payroll, the number of workers that extract abaca in their plantations to sell it to the company without a legal labor contract, is larger. Children walk through a ballast road to enter or leave one of the Furukawa´s farms. They have to walk in order to get to the highway and take a bus to go to school. Parents, sometimes, pay a dollar for a motorcycle ride. But they don´t always have the money and end up removing their kids from school. The farms stay closed, access is limited to the Furukawa´s trucks that pick up the fiber. In case of an emergency, people have to carry out the injured ones using hammocks or motorcycles because there is no access to vehicles. Marcelo Almeida, manager of the Furukawa company. Almeida -who is also honorary consul of Norway in Ecuador for 15 years now- could not remember during the interview with Plan V and La Barra Espaciadora, if the company has ever acquired work clothes or industrial safety tools for his employees; "I can´t know everything, do you think one gets to know things like that", he answered. Two days after, via email, he wrote: "The Furukawa workers do receive all kinds of work tools, like gloves, clothes, masks and everything else. I reiterate my invitation to see it for yourselves”." (sic). But in the fields, reality is quite different. The abaca is a plant from which a highly resistant fiber is extracted, this fiber is also used by the auto industry as a substitute for fiberglass. But this property also makes it mortal for the workers who process it. One thread could turn into a blade capable of severing limbs. Most of the accidents are suffered by the abaca workers who operate the decorticators, devices brought from Japan and India that have not been replaced after more than fifty years of use. The workers wrap the fiber on these decorticators, that run on diesel, in order to remove the excess water and shred the fiber. If not careful, the fiber could catch a limb. The machines belong to the company. They were brought from Japan and India, they are very old. The landlord/workman must pay for the upkeep of the machine as well as the cost of any damage. This happened to Wilfrido Santos, in 1985. His right leg was almost mutilated. He said the doctors used an iron box to hold the bone pieces together. 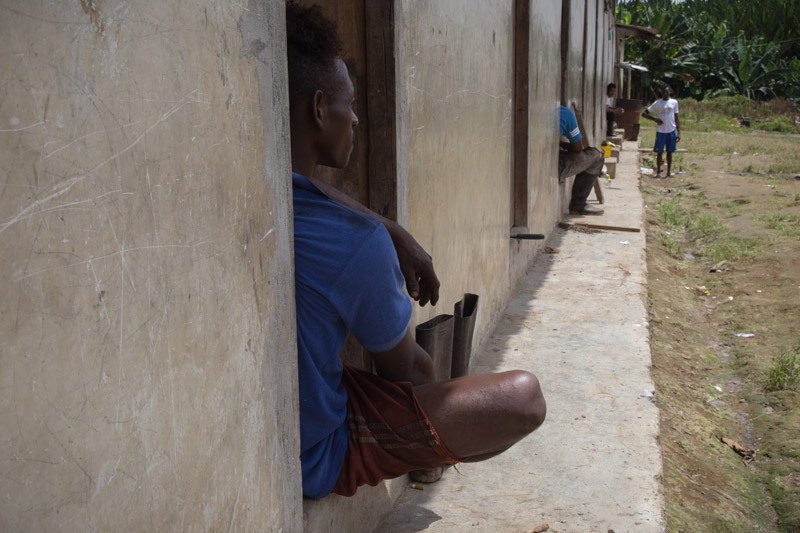 His leg is now hook-shaped and makes him limp from walking so much despite of it he returned to work with abaca because it is the only thing he knows how to do, just like hundreds of other abaca workers. Two years ago he was hit again by the machine, so he stopped running it, now he works cutting abaca stalks for 10 cents of a dollar each. Wilfrido Santos´s leg is a witness to the risks of operating the machine. He said the doctors attached a metal box and with time his leg became hook-shaped. Watch his testimony here. Labor inspectors found on the field a young man without his left forearm. At the farms, people still remember the underaged kid who cut his leg off, some of the abaca workers say that -in that case- the company did pay a compensation. 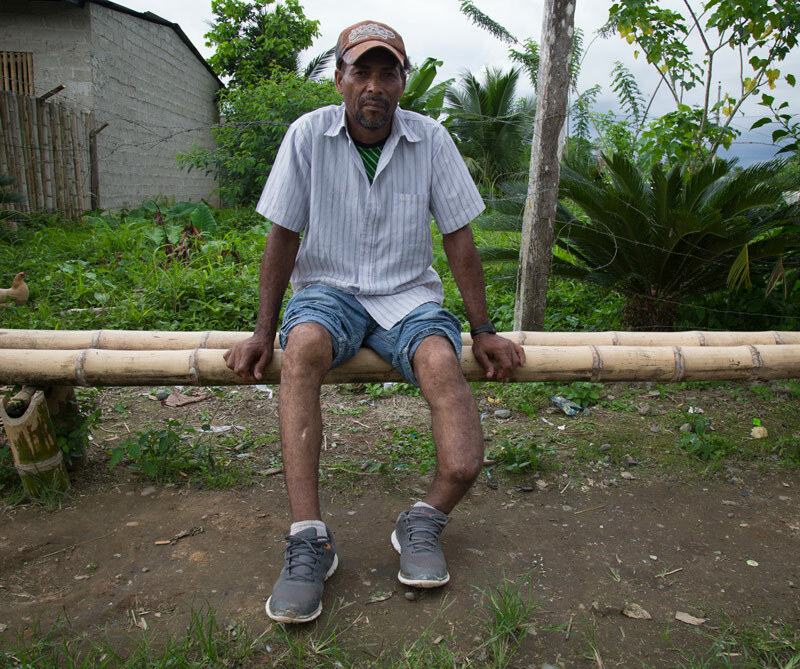 Almeida acknowledged that a person did suffer a leg amputation and claimed that they gave him enough money to buy an artifitial leg and build a house. He said he can assure that there is not a high incidence of accidents. 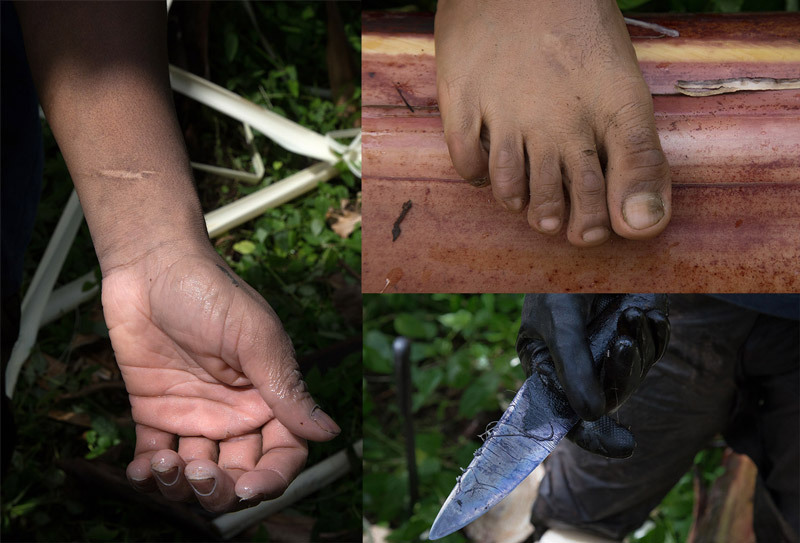 FROM LEFT TO RIGHT: The hand of a 12-year-old was cut while ‘tuseando’ (extracting the fiber from the abaca stalks), the mutilated finger of an abaca worker who engaged on the same task and a young man who lost his left forearm while operating the decorticator. The Ombudsman Office and four ministries (Health, Social Inclusion, Labor, and Politic Management) have corroborated that on the Furukawa grounds there are disabled people whose disability was caused by workplace accident. There are men without fingers or with machete or knife cuts as a consequence of some manual tasks. Children and women also have hand injuries. "I cannot affirm anything until I go there to verify it -was Almeida´s answer when asked about the human rights violations in their properties-; you are making claims about children, people injured. Of course, there are injuries. How many people die due to traffic accidents?" The Food and Agriculture Organization of the United Nations, FAO considers the abaca as the ‘fiber of the future'. But, in Ecuador, the world´s second largest abaca exporter, its as if time has stopped for the hundreds of farmers that work for Furukawa. Inside of each one of the 32 Furukawa farms, there are camps where the abaca workers live with their families or part of their families. 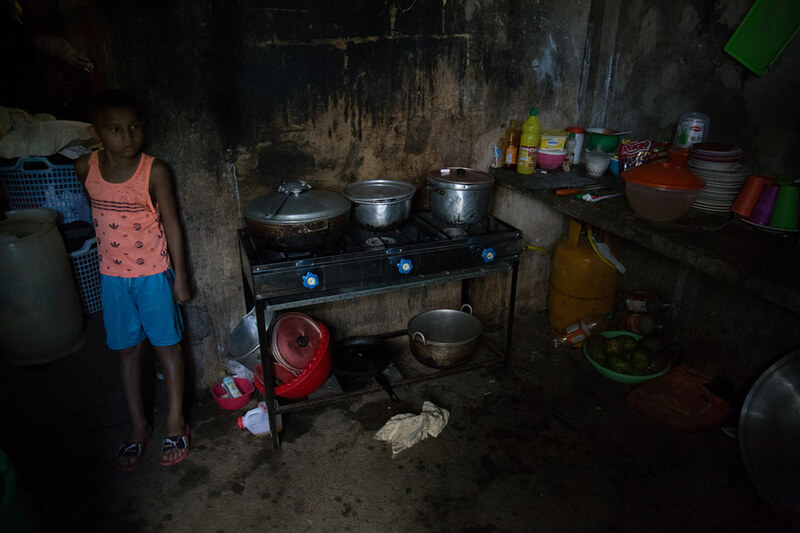 The rooms are made of blocks and cement, they live there in crowded conditions. One room can house from one to eight people. These old and precarious buildings don´t have bathrooms, people drink water from a well or a nearby estuary contaminated with abaca residues. They also don't have constant access to electricity. Each camp has a power generator that is on at the end of the day for only three hours, or as long as the fuel lasts. The workers have provide the fuel. In some of the cabins there are beds, mattresses, kitchenettes, and gas cylinders clumped together. 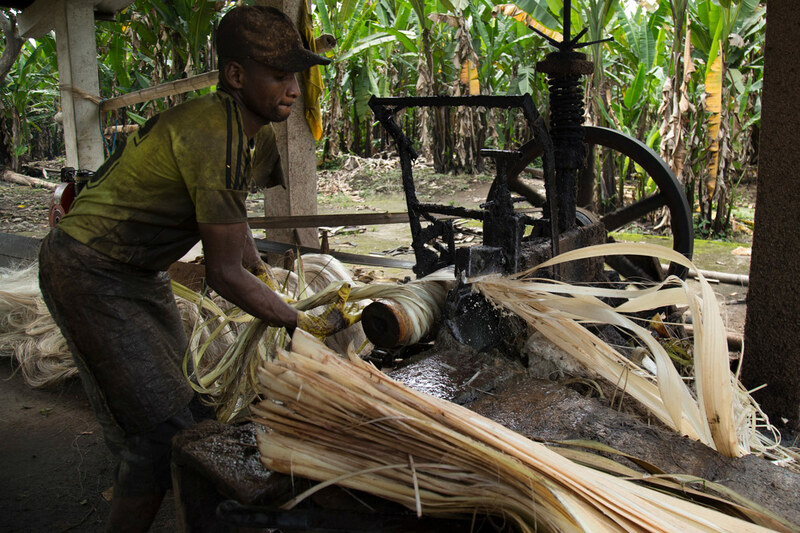 A young man works on the ‘tuseo’ of the abaca stalks. This task consists in the extraction of the fiber from the stalks. It is common to get cut on hands and feet due to this job. BELOW. The workers provide their own gloves. Women work on ‘tuseo’ with rudimentary tools: a knife and gloves that they bought themselves. 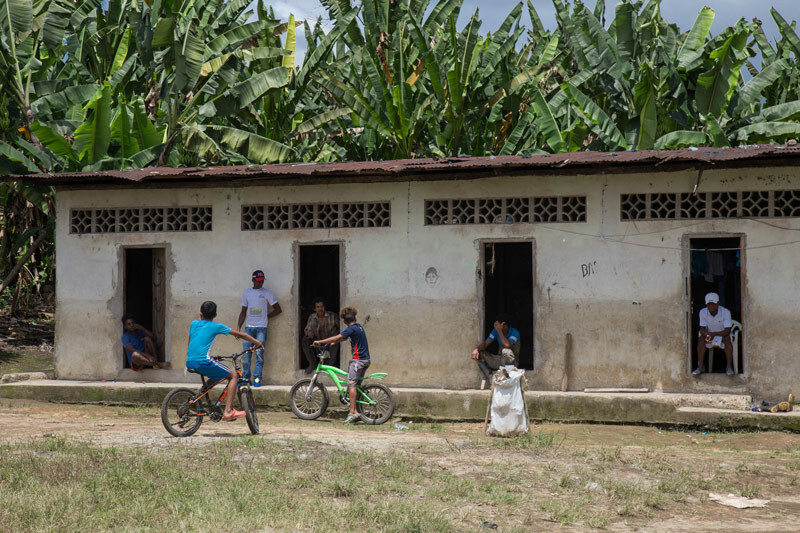 Hardships are part of everyday life for the abaca workers, even though the minimum wage in Ecuador is 394 dollars a month, they receive from 200 to 300 dollars. Dozens of testimonies were collected. 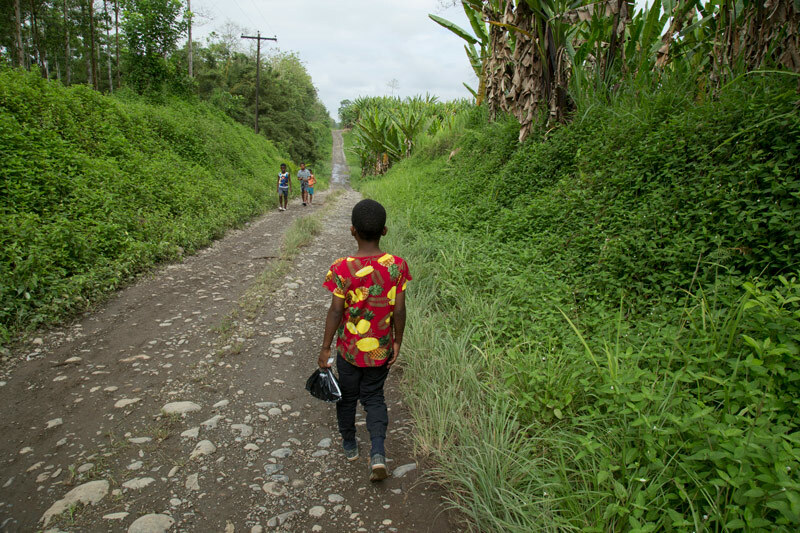 In dozens of testimonies collected by Plan V and La Barra Espaciadora from parents living in six camps, where they said that they removed their kids from school due to lack of resources. There are some workers who never went to school and they can barely scribble their own names. 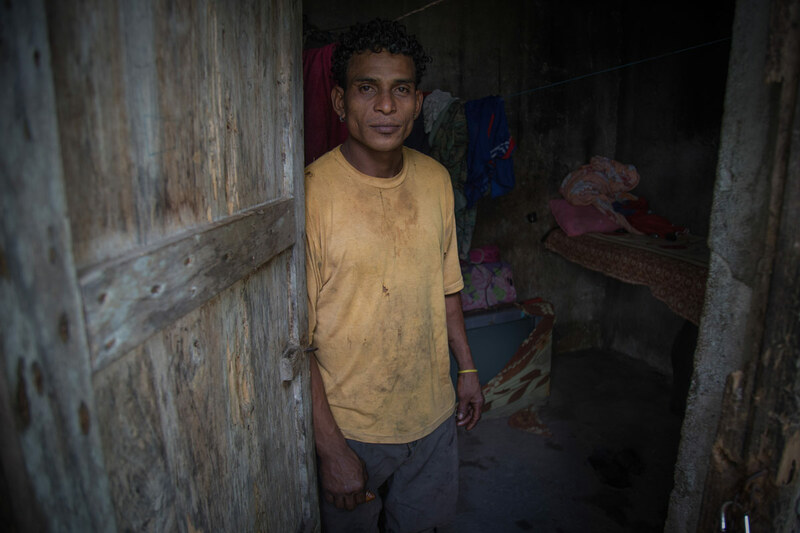 Many farmers don´t have an identity card and some of them were born inside of a camp. To increase the family income, children and elders also work with abaca as well. For a year now, 105 employees and former workers have been reporting these working conditions, such as not being affiliated to social security or not having employmenf benefits. One of the main reasons for their discomfort is the absence of an employment contract with the company despite living and working in the Fukurawa facilities. From 32 farms, 25 are rented by abaca workers who are iliterate and who have rustic knowledge of their craft. They have the commitment to only sell the harvested abaca to the company. The camp facilities are built out of blocks and cement. Each one of this small rooms can house from one to eight people. 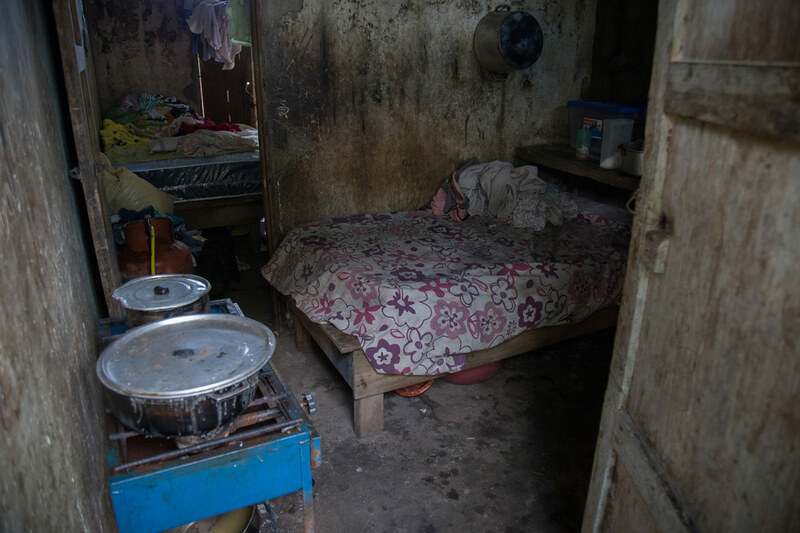 Families live there in crowded conditions. The small space they have for their kitchen is also used for sleeping. the company enduring abuses because of need and fear, they are waiting for the Ecuadorian authorities to respond. Meanwhile, they keep operating that mortal fiber extracting machine. In the midst of the deafening noise, Adolfo Quiñónez, a 34 year old, runs it. He is wearing shorts and a plastic apron. He has been working on this for 16 years. He says that he was saved by a miracle once when a little string got wrapped around his leg. "I would be ‘mocho’", he tells us, now relieved. 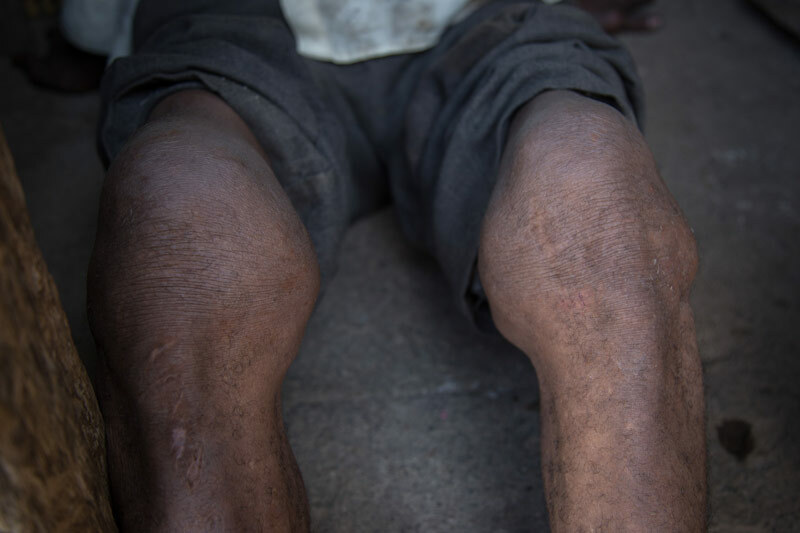 The residue water from the abaca splashes on his legs, his skin looks harmed by eruptions. When it rains the floor becomes slippery, so his job becomes more dangerous. He learned to operate the machine just by watching the older ones. Underaged kids use boards that help them reach the pedal of the machine. The gloves -dishwashing style- were bought my himself. boots with an abaca stalk inside them to prevent the calluses caused by the constant friction with the plants. His pores are bursting with sweat as he tells us how he started as a ‘tusero’ when he was 13 years old. ‘Tuseo’ is one of the tasks when processing abaca. The person doing this work extracts the fiber from the plant´s stalks that were previously felled by another worker and piled up. The ‘tusero' or ‘tuseador' is the person who detaches the external layers of the stalk until he finds the fiber, then he classifies it according to its quality, the whiter it is the more value it has on the market, then he assembles new piles called ‘tongos' or ‘tonguillos'. Any abaca worker who performs this task will always have cuts on his hands, even if he wears dishwashing gloves he has bought for himself. Other workers do this task without any protection. Joffre Chila´s fingers look like doodles due to working without gloves. He can´t fully close his hands. His knuckles are swollen and enlarged because of the effor needed to cut and pull the fiber. After 21 years of working at Furukawa, his hands resemble a pair of stiff gloves full of calluses. Work starts at 5:30 and ends at the same time in the afternoon. He suffers a lot of pain at night. 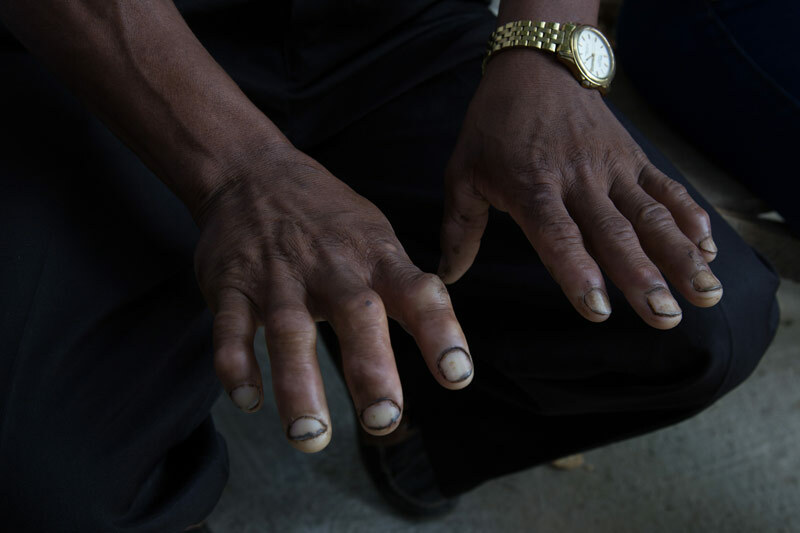 The hands of a ‘tusero' become deformed with time, full of calluses and enlarged knuckles. Joffre Chila, who has been doing this task for 21 years. At night, he suffers lots of pain. Watch his testimony here. The calluses are the result of the constant use of the knife in his work as a ‘tusero'. 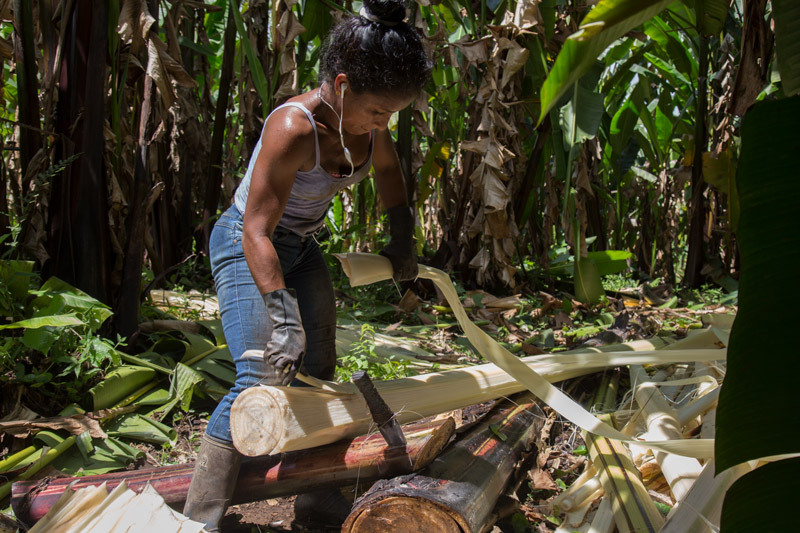 The abaca workers divide the work into six tasks. In addition to the ‘maquineo' (machine operating) and the ‘tuseo' (the fiber extraction from the abaca stalks), then comes the ‘zunqueo' and the ‘talleo' that consist in removing the leaves from the stems; the "burreo"; is to carry the fiber on donkeys to the machine, and the "tendaleo"; which means hanging the fiber inside greenhouse-style sheds to dry it. This last task is done, mostly, by women. 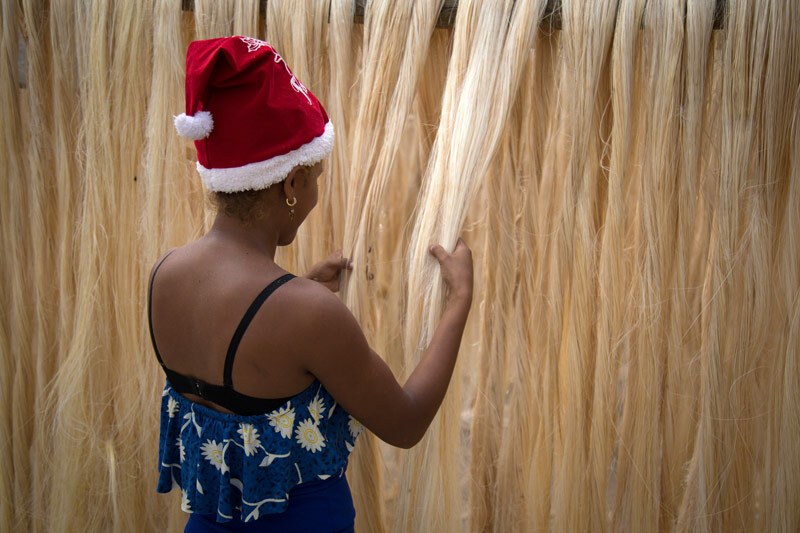 Ángela, a teenage mother, covers her head with a Christmas hat to avoid the dust that comes out the abaca. 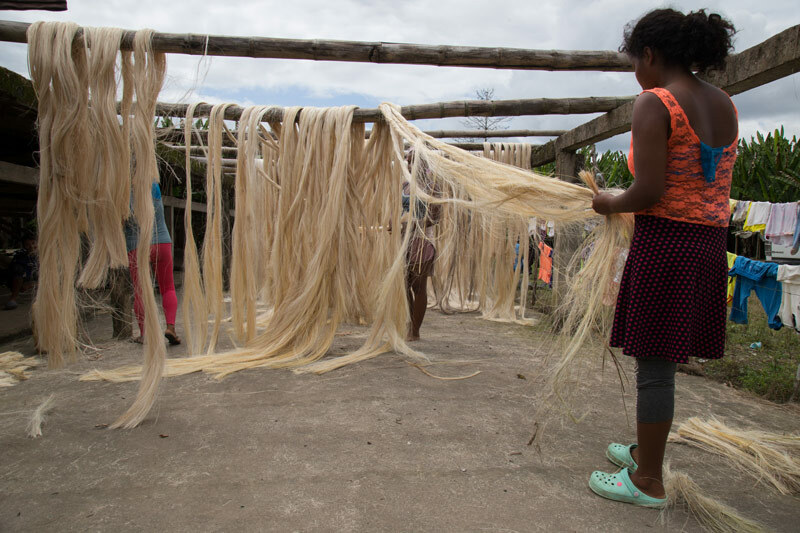 One of the tasks in the abaca process is ‘tendaleo'. This consists of hanging the fiber in greenhouse-style sheds to dry. Women are mainly in charge of this work. In the images above and below, teenagers stretch the fiber. One of them is covering her head with a Christmas hat to avoid the abaca dust. In the last image, a worker shows her head full of dust. She told us it causes itching. The boss of the group or tenant is the one who receives the payment from the company twice a month, then distributes it among the workers. If someone suffers an accident inside the camps, he is the one who must seek medical attention in a public health center or look for a private doctor. He must cover all expenses. 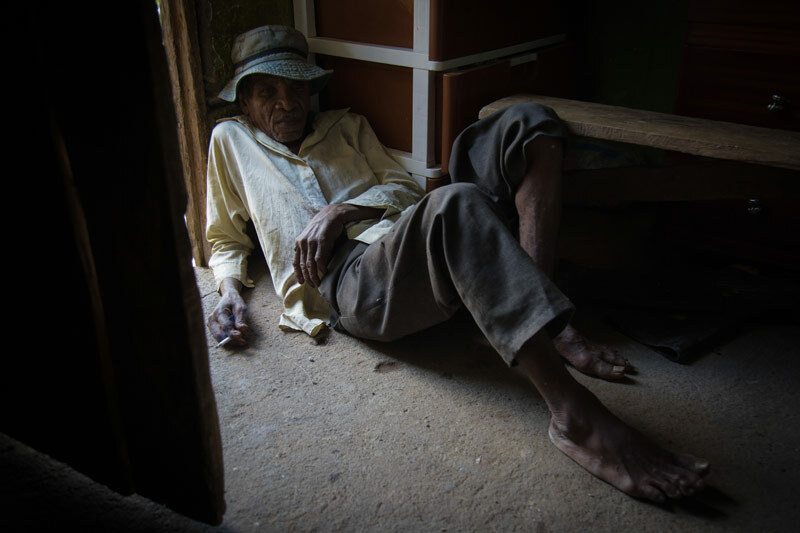 Ángel Sánchez, the tenant of one of the Furukawa farms, pays a doctor at the end of the month to attend the abaca workers in his camps every time they get cut. The experience inherited over generations is the only training the workers have had. On November 20th, 2018 the Ministry of Labor inspected Furukawa, they found 31 infringements of the safety and health regulations. The worker´s lack of information regarding the hazards at work was among them. The Company´s Work Regulation dates back to 1966. The manager says he does not have information about those reports. The rooms in the camps are old and dark. People drink water from a well and they have available three hours of electricity that comes from a power station. The kitchen of one of the rooms. Without electricity, people´s diet is based on non-perishable products, usually rice and beans. The kitchen is also used as a bedroom. Gas tanks and people cohabitate in a narrow space. The abaca is like a wild plant. It is not necessary to sow it manually. It is resistant and does not require much care such as fertilizers and pesticides. Most of the farms are located along the Quevedo-Santo Domingo road. The plantations can be seen from the roadway. Sometimes they are confused with banana plants because of their resemblance. The Abaca is originated in the Philipines. 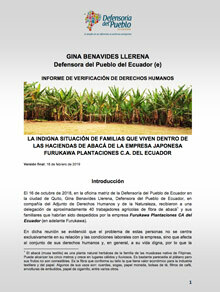 The strains were brought to Ecuador by the Japanese family Furukawa more than half a century ago. Searching for a place with good climatic conditions for cultivation, they arrived to Santo Domingo in 1962. A year later they founded the company Furukawa Plantaciones C.A. of Ecuador. Three generations of that family passed through the company. The last ones were Kenichi Furukawa, who died in 1994, and his wife Hiroko Furukawa who inherited the company. She died four years ago and since then there have been some changes on the shareholders. Now the Japanese company FPC Marketing Co. Ltd holds 99% of the shares. The company has Japanese and Filipino shareholders. Currently, the CEO of Furukawa is the businesswoman Orpha M. Noveno, related to the abaca industry in her country. The Philippines is the first exporter of this fiber in the world. Ecuador follows in second place but with considerable distance. While the Philippines exports close to 57.000 tonnes a year, Ecuador reaches 10.000, according to figures from the FAO. The organization estimates an annual world production of 60 million dollars. Data from the Central Bank of Ecuador of 2016 show revenues of 15 million dollars for the country, while according to figures provided by the Ministry of Agriculture and Livestock, during 2018 Ecuador received 17,2 million dollars for the export of 7,233 tonnes of fiber. At least three generations of the same family have passed through the Furukawa farm working the abaca. Many were born there and have lived there all their lives. All of them have learned the trade by observing the older ones. They do not have information about the risks. Furukawa is the second company that exports abaca from Ecuador. Among its customers is Ahlstrom Chirnside, a leading UK fiber-based materials company. Some not so frequent buyers are Pacific Fibre and Rope, a rope company from the United States, and Specialty Pulp from Filipinas who, among other materials, manufactures paper currency. They also sold to Toyota Tsusho Corporation, from Japan, which is part of the Toyota Group. Japan is one of the main countries where Furukawa exports, also Spain. 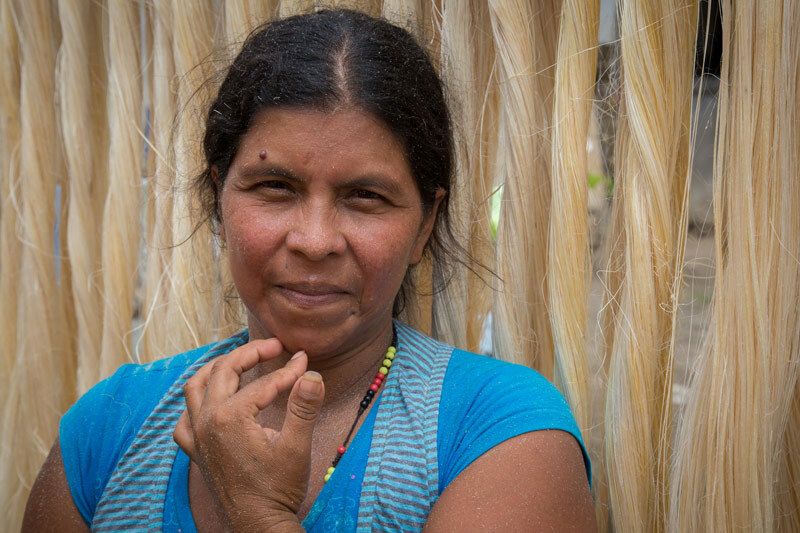 According to Almeida, the Ecuadorian abaca is being used to make dollars, tea bags, food covers, and medical clothing. On its website, Furukawa states that when the company established in Santo Domingo, in 1963, they had to overcome a great deal of obstacles due to the lack of development in that area. "Therefore, the Furukawa family and the Company with its name received special recognition from the Government of Ecuador." The company -says its manager- has never had serious problems in terms of labor law and has never stopped providing the benefits that their employees are entitled to. The payroll has 198 workers, 147 of them work in the fields. 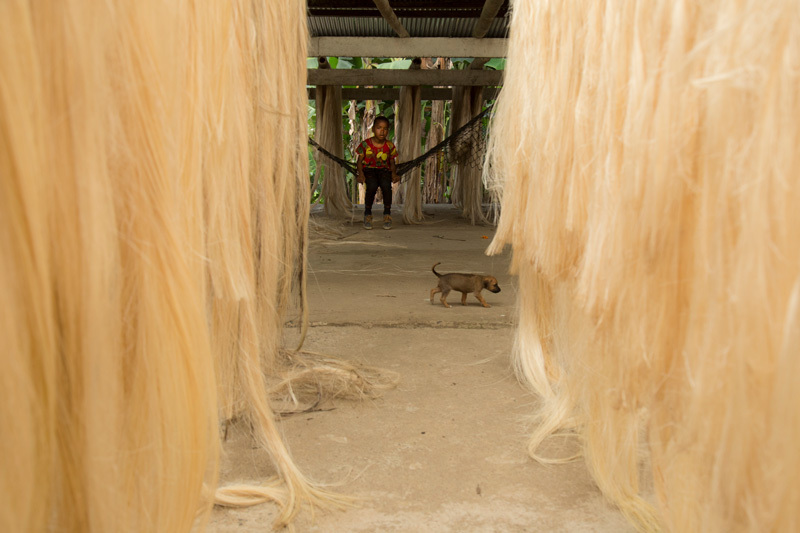 Those who process abaca as tenants are not part of that group, they are the ones Almeida is indifferent to. Seniors also work. They don´t do it every day because they suffer from pain. As a result of last year´s accusations, the authorities have turned their eyes to largely unknown sector that is abaca. Most workers come from Esmeraldas, the most impoverished province in the country. Half of a century ago the sources of work there were very scarce, when the rumor about the arrival of the company spread women and men walked to Santo Domingo. The older ones remember how the news spread by word of mouth. 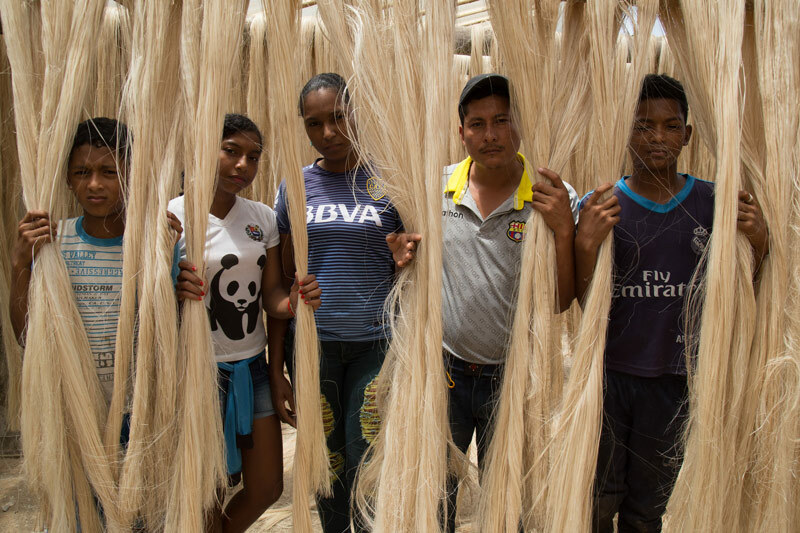 Now, most of the abaca workers are Afro-Ecuadorians. Since February 2018, a group of workers has sent letters to ministers and to President Lenín Moreno stating that they have worked in these plantations for decades without any work benefit and currently, using the modality of leasing, the company does not assume the legal obligation to comply with the labor laws. 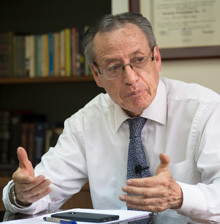 Almeida says that the problem began in 2008 when as an endeavor of President Rafael Correa, the Constituent Assembly eliminated labor outsourcing and hiring by the hour. "Until 2008, all companies worked with intermediaries or contractors". But that change "didn´t help anyone”. Almeida says that he cannot have full-time workers in the fields because their work is only required for temporary tasks such as sowing or harvesting. The company -he claims- began hiring more workers. "But people in the countryside suffer from shifts in their lives: they are alcoholics, they have maintenance proceedings. The company almost bankrupted and our lawyers advised us to lease the farms." This well has not received maintenance for more than a year. That is the water supply for entire families. One of the clauses of the contract states that it is the obligation of the lessee to assume the labor responsibilities, including the social security affiliation. 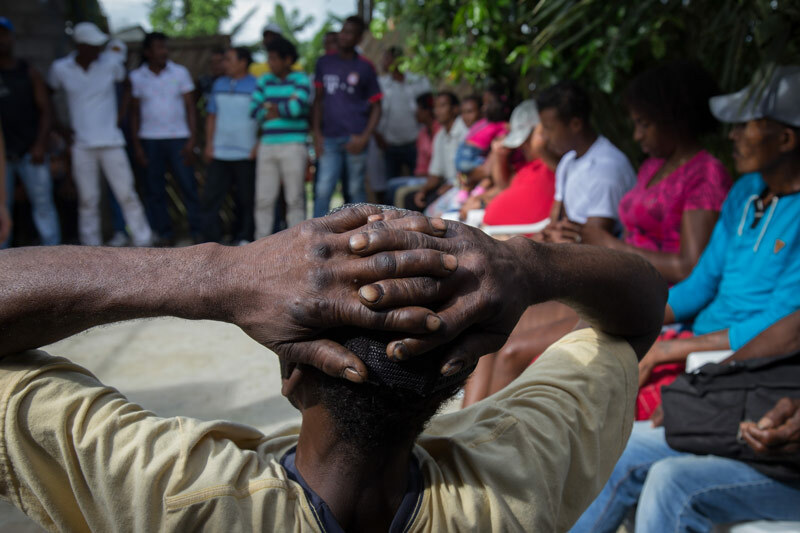 But the workers, most of whom have not completed elementary education, have told that in the Notary 4 in Santo Domingo, the officials didn´t let them read the document they signed. "I even requested a copy in order to seek advice, but they did not provide that either", one of them says. During the interview he held with this journalistic alliance Almeida slipped a confession when telling us about some of the tenants had to print their fingerprint on the documents, that is done when the signer is illiterate. That figure has been described by the Ministry of Labor as a "not very ethical employer maneuver" and in a report from last January 10 they suggest a fine of 20 salaries for 36 workers, which amounts 277.920 dollars. In the report they also recommends a sanction of 7.720 dollars due to the lack of justification for discounts on the payrolls and the suspensión of their activities. Almeida, in the interview he had with Plan V and La Barra Espaciadora, said that he didn´t know about that report. However, for him, the contracts are legal and legitimate. In his opinión, "agitators" have come to the farms to disturb the calm. A meeting of dozens of abaca workers. For a year, 105 workers and former workers have been demanding labor and their liquidations. They claim they were fired without any benefit. According to the tenants consulted, they receive a weekly payment of 640 dollars for the abaca that adds up to 2.560 dollars a month. This amount must be divided between eight or more workers. The tenant also covers the cost of the gas and diesel needed for the machines as well as the damages. There is also a fee of 50 dollars per land right. "I pay people, then I am left with my arms crossed", says one of them. The company has different data. By 2018, the average monthly income per tenant was 6.452 dollars, according to data provided by Henry Peralta, comptroller of Furukawa. The allegations include evictions from the camp. Claudio Mora, 72 years old, ended his days in the company unexpectedly. He worked there for 30 years. On December 19, 2003, he cut himself while working, he returned to find out that his camp had been evicted. They did not let him in anymore. Susana Quiñonez was also evicted on this date. She remembers the Police came and fired their gun in the air. One of those bullets -she says- hit her uncle, who later on died. "They didn´t care that there were children around". One way to disable a camp is to remove the machine, the workers say. Eighty labor lawsuits were recieved by the judges. The manager of Furukawa confirmed it himself. But from his perspective, "it is normal" during decades the company has had the same amount of legal processes. Many of these lawsuits have been filed or dismissed by the judges because the claimant couldn´t prove the employment relationship. Ramon Leones was one of them. He traveled constantly to Quito, but when he realized that the process was not progressing "I left it there" he said. Those affected said in the court record that most of them were hired verbally. Also, there are testimonies of mistreatment. "Abusive black man, I will not pay to you", the company´s chief of staff said to one of the security guards, according to his report. Quiñones also has another phrase recorded: "We will not give you a thing, black woman, no matter where you go." According to experts and activists, Furukawa is perhaps the worst case of human and labor rights violations known so far in Ecuador. Hidden inside of thousands of hectares of abaca, entire generations have been born and raised in the midst of precariousness described by the same analysts as infrahuman. The abaca, in the properties of Furukawa, is synonymous of oblivion. Who let this happen?